The heartache of miscarriage, stillbirth or infant death affects families everywhere. The impact is great; the aftermath difficult. Empty Cradle, Broken Heart offers reassurance to parents who struggle with anger, guilt and despair. Deborah Davis, Ph.D., encourages grieving and makes suggestions for coping with the loss of a baby. Incisive comments from parents who have suffered through the death of a baby convincingly relay this message: """"You are not alone and you can survive."""" Doctors, nurses, family and friends who offering support will also benefit from this book. 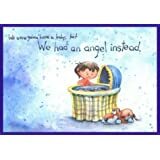 Start reading Empty Cradle, Broken Heart: Surviving the Death of Your Baby on your Kindle in under a minute. ""Empty Cradle, Broken Heart" is written with great awareness and sensitivity. Deborah Davis gets it just right." -Sheila Kitzinger, author of "The Complete Book of Pregnancy and Childbirth"
"Davis speaks directly to the emotional and physical needs of bereaved parents." -Judith Lasker, author of "When Pregnancy Fails"
"This book is a comprehensive resource for bereaved parents and the practitioners who help them." -THANATOS, "A Realistic Journal Concerning Dying, Death and Bereavement"
The heartache of miscarriage, stillbirth or infant death affects roughly 50,000 U.S. families every year. 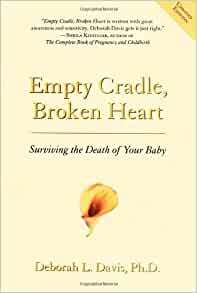 This revised and expanded edition of Empty Cradle, Broken Heart offers reassurance to parents who struggle with anger, guilt and despair after such tragedy. Deborah Davis encourages grieving and makes suggestions for coping. 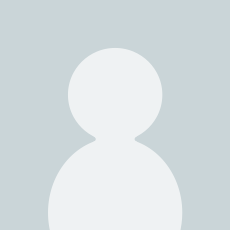 Added to this edition is new information on issues such as the death of one or more babies from a multiple birth, pregnancy interruption and the questioning of aggressive medical intervention. There is also a special chapter for fathers as well as a chapter on "protective parenting" to help anxious parents enjoy their precious living children. Doctors, nurses, relatives, friends and parents facing infant loss will find support and reassurance in this gentle guide. 5.0 out of 5 starsSo helpful to understand parental grief. As someone who has just lost their newborn child, this book has been so so valuable to me. It has taught me about my own grief processing, how to grieve 'well' and has helped me understand how my husbands grief differs sometimes from mine and that's fine, as long as we grieve according to our own nature. I read it in the bath and I have found it such a helpful thing to do to feel like I'm taking control of my own mourning. My life has completely spun out of control in these past 2 months, but reading this book helps me regain some semblance of control over learning and growing with my grief. 5.0 out of 5 starsDespite the subject, if you have been through this, then this is the book I would recommend. Of all the books I have purchased on this topic this is probably the only one I would recommend. Not an easy topic but this book is written by a mother who has been through the same experience, rather than a professional so it comes from the heart. I could not put it down despite the subject and read it in two nights. After going through the heartbreak of miscarriage earlier this year and spending alot of time on the internet searching for ways to help me cope,I came across this book "Empty Cradle,Broken Heart:surviving the death of your baby".Although nothing will ever take the pain of miscarriage away and the heartache of losing your baby,this book helps you to find ways to deal with it and give you new hope.It isn't a book which you need to read from start to finish,but a guide which you can just read the sections that apply to you. I hope one day I will have my happy ending and my child in my arms.I wish the same for any woman who has lost their baby too. 5.0 out of 5 starsHelped a bit when faced with such tragic loss . Bought this book for my sister . Her daughter was stillborn at 38 weeks . She said this book helped her in the early days because it explained a lot of her feelings and reactions . I bought lots of books when my baby was stillborn at 38wks. I was looking for answers to impossible questions, which of course I didn't find. What I did find was comfort and reassurance that what I was feeling was normal and that I wasn't going mad. I can recommend this book enough. Just glad that someone took the time to write such an open, honest book for people who need help with this sort of grief.